Based in Glasgow, we are difficult rope access specialists. We take pride in providing a first class professional service in all the roofing repair services that we do. And sometimes that means going the extra mile (or in this case, feet). Our skilled difficult rope access specialists can access hard to reach and high roofing and other details areas across Glasgow. Our reliable steeplejacks are fully committed to safety and quality, whilst at the same time being aware of any necessary time constraints. You can rest assured that repairs on your property will be carried out by expert steeplejacks who have years of experience and who will be using the latest equipment for the job. 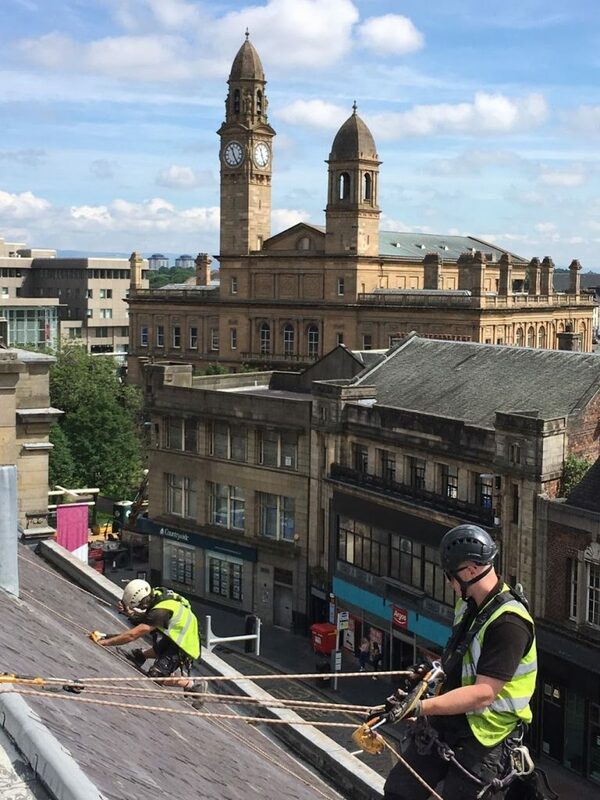 Steeplejack services at Balmore Roofing Contractors in Glasgow have been a core service within our company for many years now and we’re continually improving. You can be sure that Balmore Roofing knows the ropes very well when it comes to steeplejack work in Glasgow and all across Scotland. We provide a wide range of specialist difficult rope access skills which are continuously utilised when carrying out the varied projects required to be undertaken at high levels and heights. The very nature of steeplejack work requires stringent adherence to all health and safety legislation. Health and safety is a top priority for Balmore Roofing – we are members of ATLAS (formerly National Federation of Master Steeplejacks & Lightning Conductor Engineers) and RoSPA. At Balmore Roofing in Glasgow, we take health and safety measures very seriously, especially when it comes to potentially dangerous operations like our steeplejack services. To ensure safety, we always carry out roof inspections and roof risk assessments before beginning any kind of work. This can be done through our aerial media drone service. When performing steeplejack services, we take every safety precaution to ensure the safety of our workers and the safety of the public who may be in the area. You can rest easy knowing that the chance of accident and/or injury is minimised by the checks we put in place during every job we undertake. 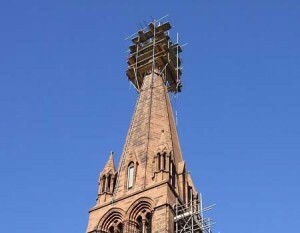 Steeplejack services are also available for listed churches and other historical buildings that require maintenance and repairs. Balmore Specialist Contracts have the skills to undertake all works professionally, efficiently and effectively. Our steeplejack’s undergo rigorous training which means that we can guarantee steeplejack work will be carried out to the exact details of a specification,be it repairs, stone cleaning or any other steeplejack service you require from us.We fully understand that buildings of historical value can be very fragile and require an extra level of care. 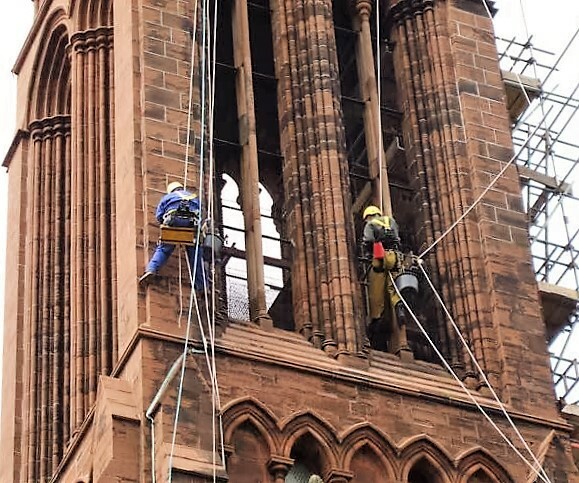 That’s why when a client requests steeplejack services in Glasgow or anywhere across the country, they know we only send experienced and qualified steeplejacks to do the job. Rope access provides steeplejacks an invaluable solution for areas that are difficult to access, allowing highly skilled and trained technicians to descend or ascend on ropes – anywhere, on any structure. Rope access can save considerable time and money. Not only does it provide a flexible solution but it is much less expensive and intrusive than the more traditional access methods, such as scaffolding or powered access machines. Rope access is ideal for tall, complex and/or historic buildings as our expert steeplejacks can then get into those hard-to-reach places with the minimum of disruption to the structure itself. Balmore Specialist Contracts technicians, using rope access techniques to reach difficult locations, can carry out an extensive range of tasks as required and specified by the client. As a long established company, Balmore Specialist Contracts aim to deliver a first class, professional roofing service sensitive to the requirements of our clients. Method Statements and Risk Assessments, along with photographic surveys can be offered to our prospective customers and provide an efficient way to view and assess problems from the comfort of the boardroom. Photographic and/or video evidence ensures that our clients can review a full record of the condition of the structure requiring inspection. Decisions based on the repairs required can then be made. For steeplejacks in Glasgow, Balmore are the company to contact. Give us a call on 0141 944 6100 to find out more about our steeplejack services.